Children at “Vaazhvaham”, home for visually handicapped in Chunnakam had a day full of fun with soldiers when solders of 14th Gemunu Watch (14 GW) visited their home recently. On directives of Commander Security Force – Jaffna (SF-J) Major General Udaya Perera, Commander 513 Brigade Brigadier Priyantha Perera and Commanding Officer 14 GW Lieutenant Colonel M.G.G.W. Rohana took the 14 GW Calypso with which inmates of Vaazvaham sang and danced on February 16th. 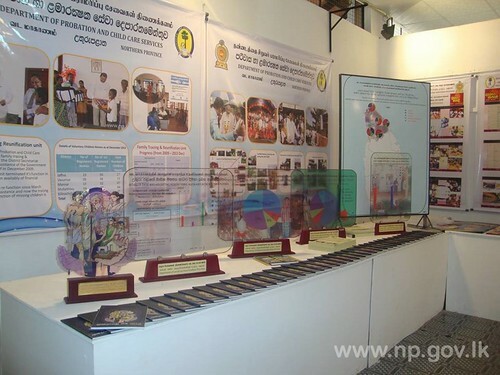 “Deyata Kirula” – the national development exhibition which was organized at Wayaba University premises was inaugurated by His Excellency the President Mahinda Rajapaksa on 21st February 2014. The opening ceremony replete with several dancing displays made it a spectacular inauguration in this pleasant evening. It is the 8th successful year and is being held in a grand scale. The President unveiled the commemorative plaque and visited every gallery. 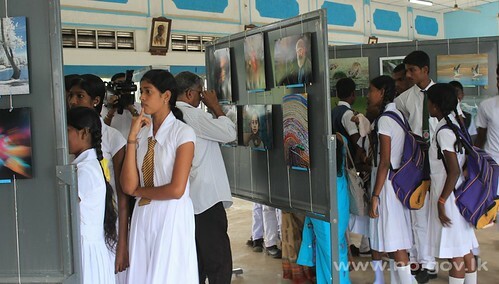 Under the theme of “Awakening of the Sri Lankan People,” this year exhibition commenced on 21st February 2014 and will be available for 7 days. Troops of 6 Sri Lanka Signal Corps (6 SLSC) of Gurunagar cleaned the old Ceynor jetty on 27th and 28th January using backhoe machines to assist fishermen using it to anchor their boats. The jetty remained unusable for a long time due to mud and garbage dumped around the jetty inconveniencing fishing folk of Gurunagar. The cleaning campaign was conducted on request made to Commanding Officer 6 SLSC Lieutenant Colonel Samitha Imaduwage by Mr. Juliet Sahayaraja, president Gurunagar Fisheries Committee representing 2400 family members. 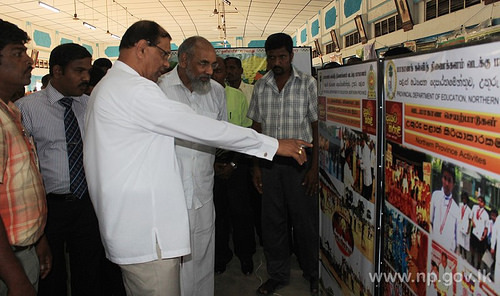 Chief Minister of the Northern Provincial Council C.V.Wigneswaran and Provincial Ministers visited Jaffna Hindu College where the things to be exhibit at the Deyata Kirula Exhibition were arranged. They observed the preparations. 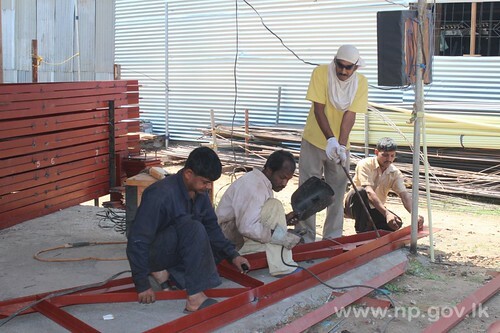 This year the developments activities in the province are to be exhibited in the Northern Province stalls. Exhibits are divided into various categories such as Agriculture, Education, Health, Local Government, Road and Tourism etc. The Deyata Kirula National Development Programme and Exhibition 2014, would be held centering three educational institutions, namely the North Western University, Kuliyapitiya Industrial College and Kuliyapitiya Central College. The exhibition premises will extend to 162 acres. It would be opened to the public from February 21 to 27. Nearly 235 school students and teachers attended an awareness lecture on oral sanitation and dental clinic organized by the Civil Affairs Office of 521 Brigade, Point Pedro (PPD) on Tuesday (11). During the dental clinic conducted at PPD Siva Prakash vidyalaya with coordination of 7th Vijayabahu Infantry Regiment of Valvettithurai, 36 students were treated. Dr. Sri Nivasan of Jaffna Teaching Hospital mobile dental clinic unit, Dental surgeon of Manthikai Base hospital Dr. S. Senthilkumaran and his medical staff conducted the programme. In another stage in the process of releasing civilians’ properties used by the Army, five Battalions withdrew from 23 houses in 51 Division area on Saturday (25). Headquarters and company bases of 9th Sri Lanka National Guard (9SLNG), 23rd Gajaba Regiment (23 GR), 25th Vijayabahu Infantry Regiment (25 VIR), 11th Sri Lanka Sinha Regiment (11 SLSR) and 14thGemunu Watch (14 GW) were shifted to new camps handing back those houses to respective Divisional Secretaries in the presence of the owners. General Officer Commanding 51 Division Brigadier Chula Abeynayake, Commander 511 Brigade Colonel Priyanka Fernando and Civil Affairs Officer 513 Brigade Lieutenant Colonel Sarath Amarasinghe handed over the documents with regard to release of the properties to Mr. S. Muralitharan, Mr. M. Pratheepan, Mr. Nantha Gopalan and Ms. S. Theivendran, Divisional Secretaries of Santhilppay, Thelippalai, Uduvil and Jaffna. 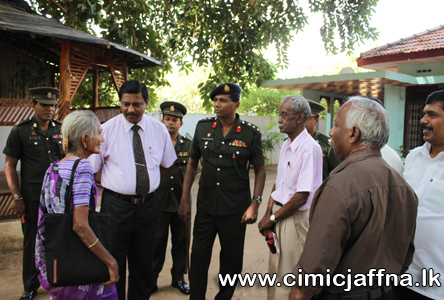 Process of releasing civilians’ properties in Jaffna was expedited on directives of the present Security Forces Commander (Jaffna) Major General Udaya Perera. 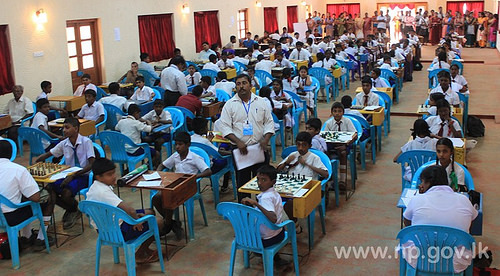 The Governor’s Trophy Chess Tournament for Valikmamam North Education Zone was commenced on 09th February 2014 at Ramanathan College, Maruthanarmadam. Governor of Northern Province GA Chandrasiri participated as Chief Guest and commenced the competitions. Governor addressed the gathering. 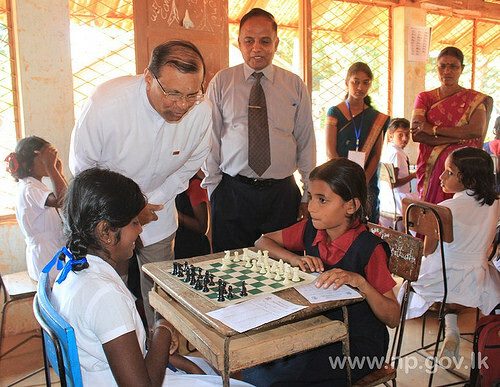 He also explained the mechanism of the chess and discussed relevant things with the arbiters, teachers and students. Chess Tournament for the Governor’s Trophy has been commenced since 16th January 2014 has been and conducted in all five districts. Presently zonal level competitions reached final stage. Next, the district and provincial level competitions are to be commenced soon. This competitions are conducted under the guidance and direction of the Governor to develop the skills of the north students. Secretary to the Governor S.Ilaangovan, Assistant Secretary JX Selvanayagam, Assistant Secretary of Jaffna Regional Commissioner Office S.Annadurai also took part in the event.